The Perfect Polish: Nails Inc. Yes, my fabulous followers, it's true - I am a nail polish addict. But I'm damn proud of it! Nail polish is such a simple, inexpensive way to update or complete a look. I consider it to be one of your best accessories. In the words of Rachel Zoe, if you have a chip or something is just not right with your polish, it all has to come off. I will literally bite off all my polish if its not perfect (kinda a gross habit, but I'm working on it). Once I discovered Nails Inc., however, my nibbling was put to rest. 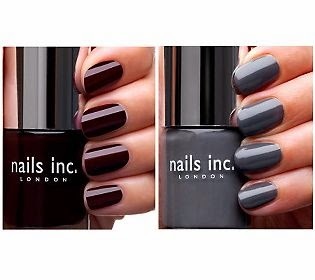 Nails Inc. is a London brand that recently launched in the States. 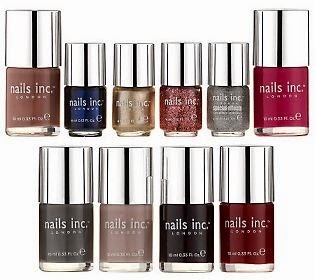 I first saw Nails Inc. on my beloved QVC during a Tuesday Night Beauty segment. I watched in awe for an hour at this SELF LEVELING polish ! No matter how horrible you are at doing your own nails, it dries to perfection. It takes all the guess work out of giving yourself a manicure. 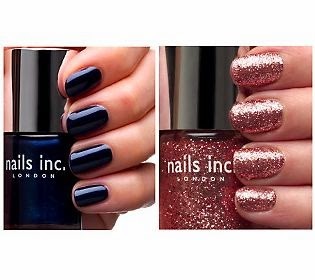 Nails Inc. polish has a beautiful range of colors that are fully saturated. There have been times I've only needed one coat. I've used Nails Inc. color polish with both its counterpart Nails Inc. base and topcoat as well as my typical favs. I've gone well over 4 days with Nails Inc. without my mani dulling, chipping, or lifting. My first set was, of course, from QVC. I got it on a Today's Special Value, so I paid about $30 for 10 polishes (6 full size, 4 minis). It's available now for $40 on QVC, which is still a huge steal. 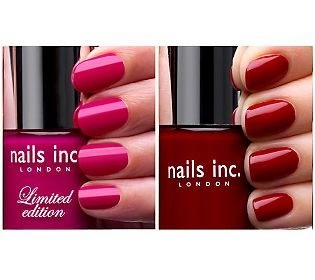 I'm currently wearing the deep hot pink color, called Lower Regent Street, which is included in the set discussed above. My love for Nails Inc. grew greater and greater and I just had to purchased another set. I found a great QVC set for Spring/Summer called "Pretty in Pastels" (4 full size) for $24.50. The colors are absolutely perfect for the season and the polishes last forever. Since the colors are so saturated, there is never waste. Nails Inc. is also sold in Sephora and they sometimes have huge sales on the prior season's polish sets. I got a set of 6 minis for $12 a few months back. But, individually they cost $9.50, which is comparable to brands like Essie, OPI, and Zoya. 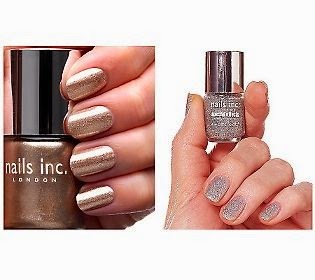 I promise that you won't be disappointed with this nail polish. It is a fantastic investment for both nail novices and aficionados alike. Thanks for reading You Have the Right to Remain Fabulous' latest post.